Good Morning! Well its snowing and blowing here, but only a mere -3 degrees… so whose complaining!? Although I believe we are on day 10 of this wind, I’m noticing everyone seems to be getting immune to it… unfortunately! 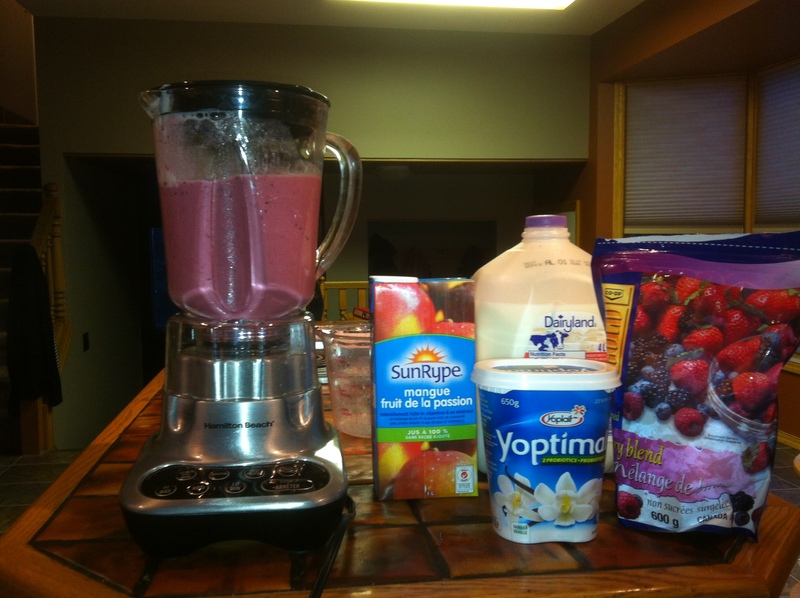 However, there is nothing better to Jump Start a miserable day then with a delicious smoothie! For the last couple weeks I have decided to start making smoothies for breakfast rather then a dense bagel loaded with cream cheese (trying to get on this health kick). I used to think I needed a bagel to help tie me over to my 10 o’clock snack… HEY dont Judge ME!.. So I eat all day, its all good… BUT since I started making a smoothie jam packed full of Deliciousness I have NO issue getting to lunch. Even my “MANLY MAN” won’t leave the house without this in the morning… On an even better note it gives you that kick in the a$$ you need in the morning (especially when you combine it with a nice black coffee… it makes you feel like Sally O’Malley “I like to KICK IT.. & Stretch… & Kick!”). Plus it couldn’t be an easier quick breaky for those of you on the run & NO mess! The best thing about Smoothies is you can make it into whatever you like… Pinterest has TONS of cool smoothie recipes! I also read to throw some oatmeal in it… I am yet to try this! Any of you have a favorite smoothie recipe you want to share….? Enjoy your Thursday Everyone!!! You almost made it through another week! ← Welcome to WildRose Gypsy!